We are 20 years on stage this year. 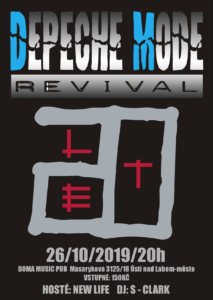 We would like to invite you to a party at the Doma – music pub on the October 26th, 2019. We are very pleased to invite you for the NORTH PARTY 2017. We will visit tree countries during the March with our production. Czech Republic (March 11th, 2017 in Pisek), Germany (March 18th, 2017 in Döbeln), Slavakia (March 25th, 2017 in Tatra mountains). We are preparing the new song (the latest single of Depeche Mode) called Where`s the Revolution. This year’s first gig will start on January 7, 2017 at the “Hvezda” pub in Teplice. Next gig on January 14, 2017 at the “Galaxie” bar in Ceska Lipa. And the last January concert we will play at the small private club called “Rodrigues” which is located in Domazlice. The band will have a gig at the Loket castle on April 15th, 2016. EVENT PROMOTER NOTICE !!! For the ticket booking call number : +420 352 684 648 – every day from 9 am to 5 pm.